Description: The Helena/Three Forks local switches Townsend on a cold rainy June morning. Description: Heading back to Helena from Three Forks, a local tops the hill at Winston. Title: MRL 405 "Livingston Local"
Description: A pair of MRL GP35's back their local freight off of the wye and into the MRL yard in Livingston. We chased this train east from Bozeman Pass, and he used the wye with the old NP Yellowstone Branch (now an MRL industrial spur) to turn his train and back into the Livingston Yard. Description: A pair of MRL GP35's drfit down the east slope of Bozeman Pass with a short local. 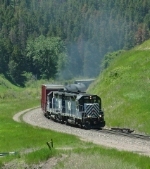 Description: Eastbound MRL local climbs the west slope of Bozeman Pass. Description: Eastbound over Bozeman Pass about to duck into the tunnel. Description: Passing the summit marker eastbound on Bozeman Pass about to enter the tunnel. Description: Unmanned helpers from LAUSPO attached to the 841 local at Bozeman headed back to Livingston. Description: West end of Bozeman headed back to Livingston. Description: I normally avoid non-RR markers in shots, but in this case, it works & ID's a noteworthy milepost. The only reason MRL has any of the line that used to run to Yellowstone intact is to service RY Lumber on the switch below 405's fuel tank. The line ends about 10 carlengths south of the locomotives. Description: "Pan" shot of late-day return from Bozeman (stuck behind stranded ballast train). Description: Returning from R-Y Lumber with power for C-BKMSPB in the background. Description: The Livingston Local heads downgrade near Bozeman (the town). Description: The coal train gave the local the OK to scram, so they did so. Description: Local heads up Bozeman Pass on its way back to Livingston. Description: Montana Rail Link local heads up Bozeman Pass on its way back to Livingston. Description: Local heads out of Livingston for Bozeman. Description: Local heads back to Livingston from Bozeman. Description: The 405 is nearly done with its complete electrical over-haul and upgrade. A few weeks after this photo was taken the unit was back out on the road. Description: MRL 840 local power waits to get lifted east at Logan. Description: The newest issue of TRAINS LOCOMOTIVE 2010 say's that the GP35 was "the most hated locomotive ever produced in quantity". Description: It's a rare treat to see a trio of GP35's in 2010! Even better when painted in MRL blue!